Responsible for Sichuan which encompasses a large part of Tibet. Likely to join the Tibet Contact Group. Education: Has a degree in philosophy, a Master’s from the International Business school of Hunan University and a doctorate from the management school of Sun Yat-sen University. Career: 20 years with the Organization Department in Beijing, interspersed with periods of study (1983 – 2003). In December 2003 moved to Hong Kong to the SAR Liaison Office, rising to be Director of that Office 2009 – 2012. Party Secretary of Guangxi Zhuang Autonomous Region 2013 – 2018 and of Sichuan from March 2018. Prospects: Sichuan is regarded as an important Province because of its large size. Peng is a member of the 19th Central Committee. Relevance to Tibet: Responsible for a large part of Tibet. Likely to join the Tibet Contact Group. This is a “mini” profile. See Overview box above right. 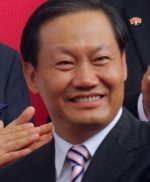 It should be noted that one of the factions named by Xinhua in December 2014 was the “Secretary” clique, which included a number of officials in Sichuan Province linked to Zhou Yongkang’s tenure as Party Secretary from 1999 – 2002. Two of those named were Guo Yongxiang and Li Chongxi, formerly deputy Party Secretaries of Sichuan. Mini-profiles of officials within Sichuan Province are also available on this site: Shi Jun, Sichuan’s Head of Public Security, Liu Zuoming, Party Secretary of Ngaba Prefecture and Wu Zegang, Governor of Ngaba Prefecture.